Digital Talking Parrot can learn what you teach it; it can mimic sounds, a bird song, or a human voice, or any kind of sound if you spend sometimes to teach it. 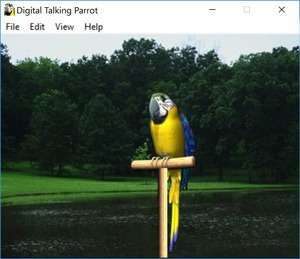 Digital Talking Parrot though can talk, laugh, sing, mimic bird%u2019s songs, and imitate human sounds thanks to the built-in database of phrases included. Version 1.0.25 is a freeware program which does not have restrictions and it's free so it doesn't cost anything. For security reasons, you should also check out the Digital Talking Parrot download at LO4D.com which includes virus and malware tests. Additional screenshots of this application download may be available, too.